Air pollution is a global public health crisis, with more than 95% of people across the world breathing unsafe air, and several million deaths per year attributable to it. 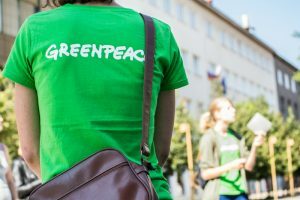 Unprecedentedly detailed satellite data generated by the European Space Agency’s new satellite and analyzed by Greenpeace reveals the location of the globes worst NO2 emissions sources. NO2, and NOx more generally, are dangerous air pollutants, causing respiratory symptoms and lung damage on acute exposure, increasing the risk of chronic diseases in long-term exposure. Long-term exposure to NO2 is associated with increased mortality rates world-wide. In the European Union, exposure to NO2 is linked to an estimated 75,000 premature deaths per year. In China, there is growing scientific evidence that indicates significant increases in respiratory and cardiovascular mortality as a result of exposure to NO2. Furthermore, NO2 and NOx in the atmosphere lead to the formation of PM2.5 and ozone, two of the most important air-borne pollutants in terms of public health damage across the world. 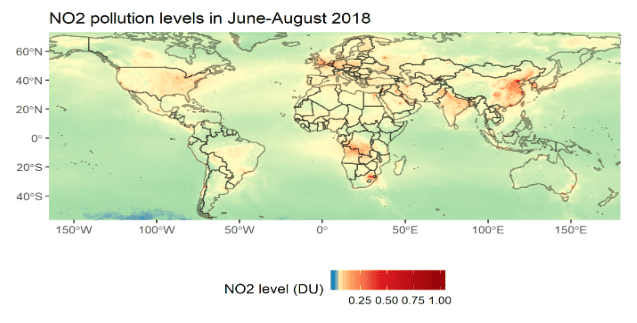 The TROPOMI instrument onboard the European Space Agency Sentinel 5P satellite has been providing unprecedentedly detailed and accurate data on NO2 levels in the atmosphere since June 1, 2018. The satellite passes over every location on earth once a day around noon local time. 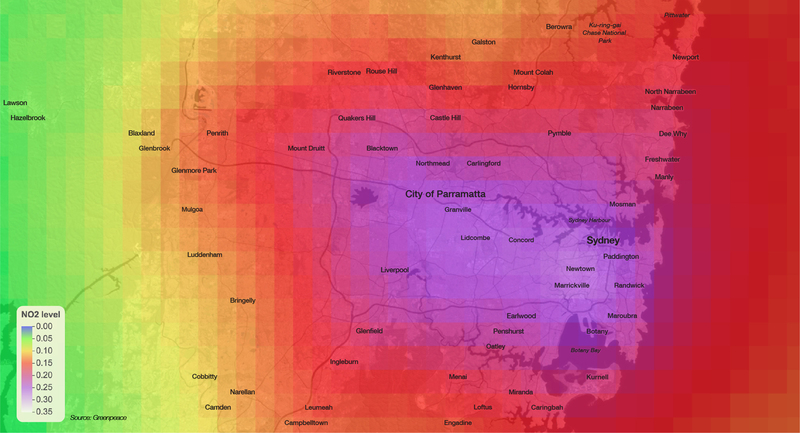 With new satellite technology, polluters will have nowhere to hide. We have unprecedented ability to identify emissions sources damaging air quality and public health, even when regulators are not doing their job. As NO2 levels are highest right around major sources, averaging the NO2 levels over a period of time enables us to reveal the biggest sources of NO2 emissions. NO2 is formed whenever fuel is burned at a high temperature or if the fuel itself contains nitrogen. 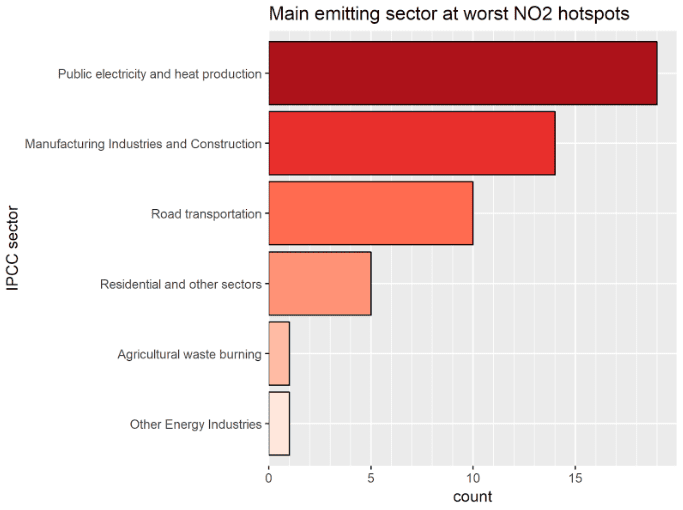 Coal, oil, gas and biomass burning all contribute to NO2 emissions. 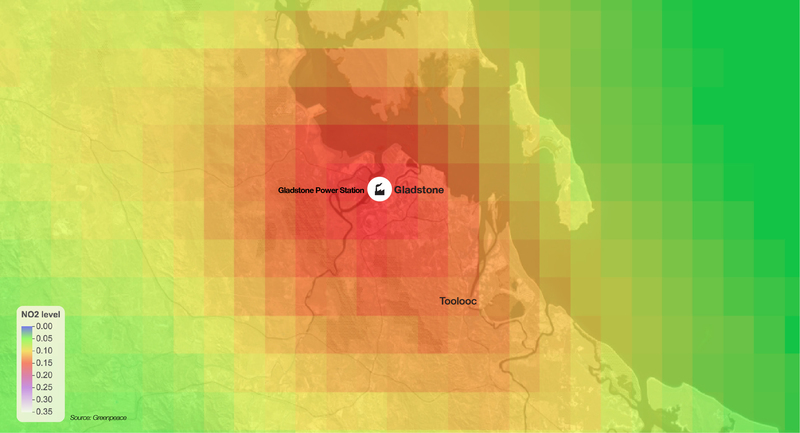 We used the EDGAR global emission database to identify the likely main sources of emissions within each hotspot. The findings of this analysis cover the three month period 1 June to 31 August. Annual or longer term trends may show slightly different results from this three month snapshot of hotspots. For example weather patterns may change during different seasons, while emissions may increase in winter. The source of the emissions is identified using the EDGAR global emissions database, a comprehensive peer-reviewed map of emissions sources. However, some anomalies may exist between the database, which is was last updated in 2012, and the present day reality on the ground. 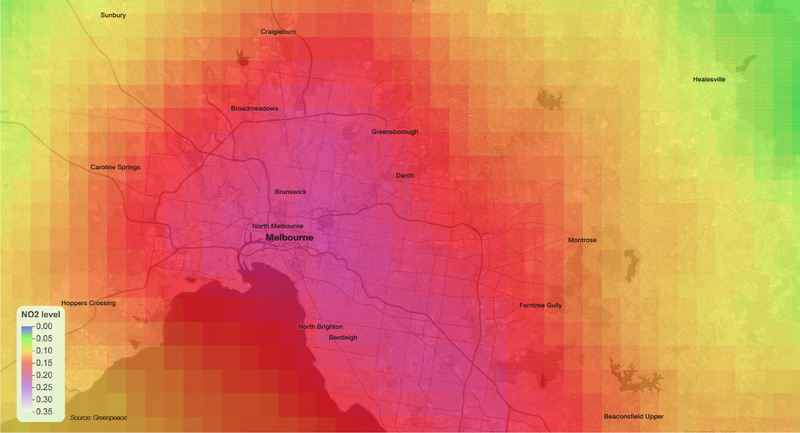 In addition, the data from the Sentinel satellite measures the amount of NO2 across the full height of the troposphere (from the Earth’s surface up through several kilometers of the atmosphere). This means that although most NO2 is found close to the ground, the satellite data is not directly comparable to ground level measurements. 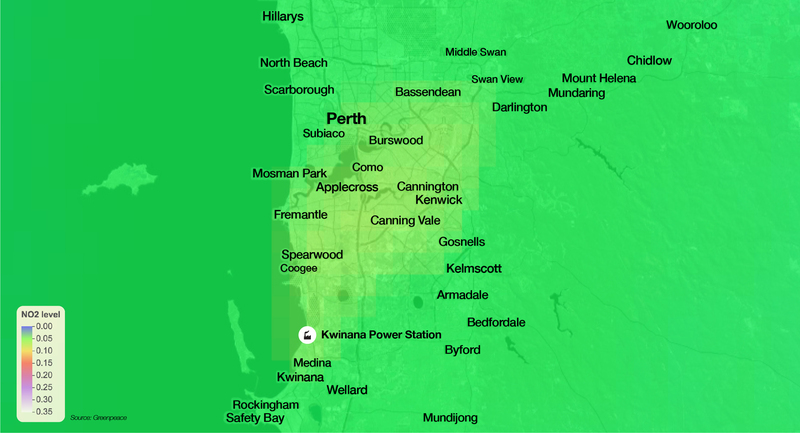 The satellite provides data points that are several kilometers apart which may not coincide exactly with the location of ground level monitors. Nonetheless, the unprecedentedly detailed imagery from the Sentinel 5P satellite gives us a powerful “eye in the sky” from which polluters cannot hide. The list of the largest emissions hotspots includes several coal-fired power plants in India, South Africa and Germany, 10 power plant and industrial clusters in China, 14 megacities with very high transport-related emissions, including Santiago de Chile, Tehran, Dubai, London and Paris; as well as agricultural burning in Congo and Angola. Some hotspots, such as Seoul, Jakarta and New Delhi, have a mix of contributing sources, including transport, coal power plants and manufacturing. 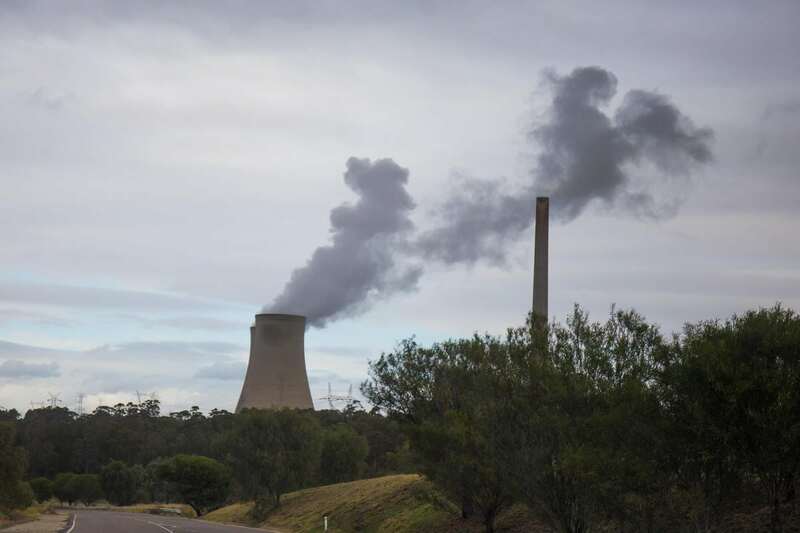 The world’s biggest hotspot is Mpumalanga in South Africa, home to a cluster of a dozen coal fired power plants with a total capacity of over 32 gigawatts owned and operated by Eskom. The data covers the period from 1 June to 31 August 2018. The largest number of hotspots, a total of 10, is found in China, eight in the Arab world, four in the EU and three in India, the U.S. and DR Congo. Power generation from coal and oil is the main source of emissions at 19 out of the 50 largest number of hotspots, followed by manufacturing industries (14), most notably steel plants in China, and transport (10). 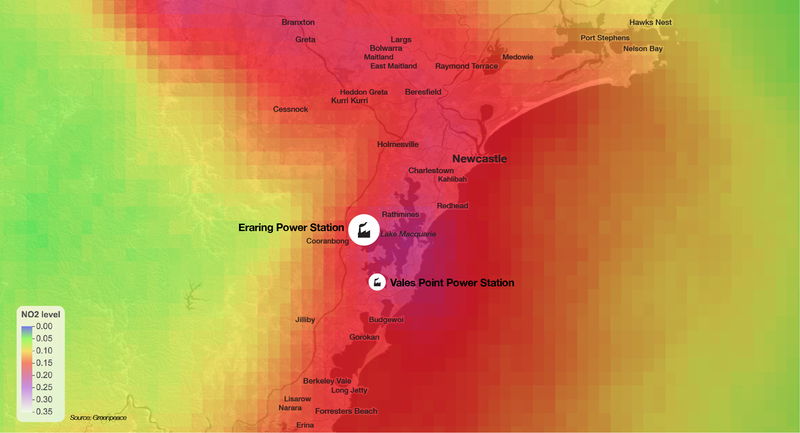 For the power plant hotspots, the main source of emissions is also readily visible from images generated from daily snapshots of NO2 levels in the atmosphere – these images show plumes originating from specific power plants. Figure 3. 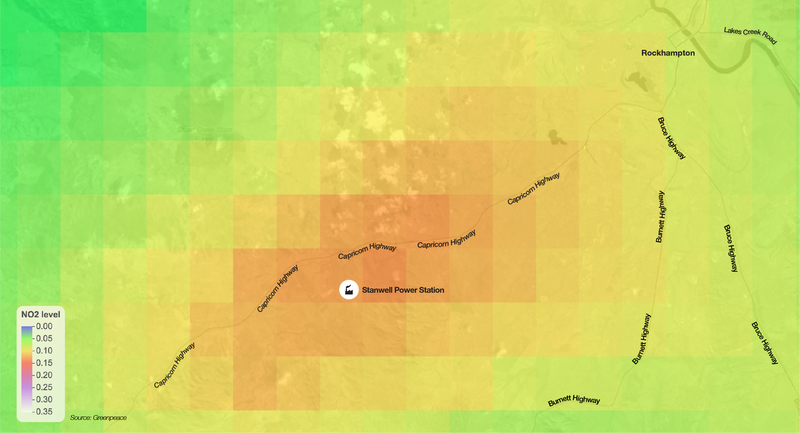 Power plant pollution plumes detected by Sentinel 5P on Jul 5, 2018, transported by winds from Eskom’s coal-fired power plants in South Africa to Johannesburg. Figure 4. 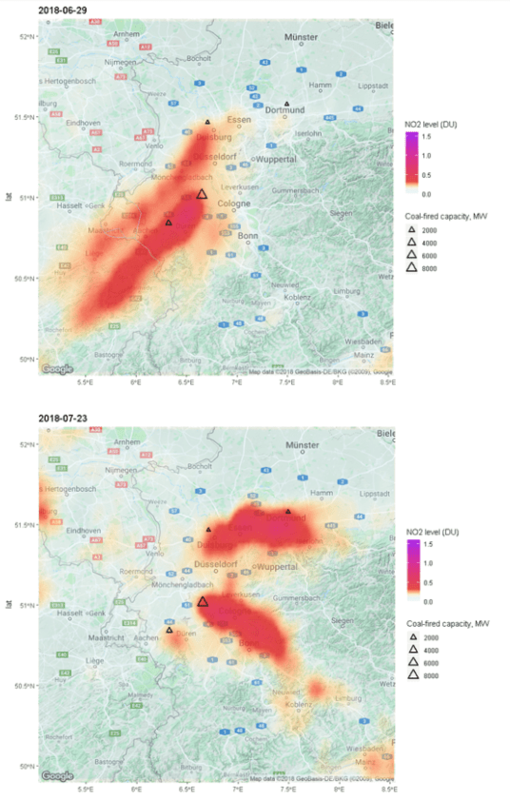 Pollution plumes transported from the Niederaussem power plant and from coal power plants and industry in Duisburg across the French border on Jun 29, 2018, and to Cologne, Bonn, Essen and Dortmund on Jul 23, 2018. Figure 5. 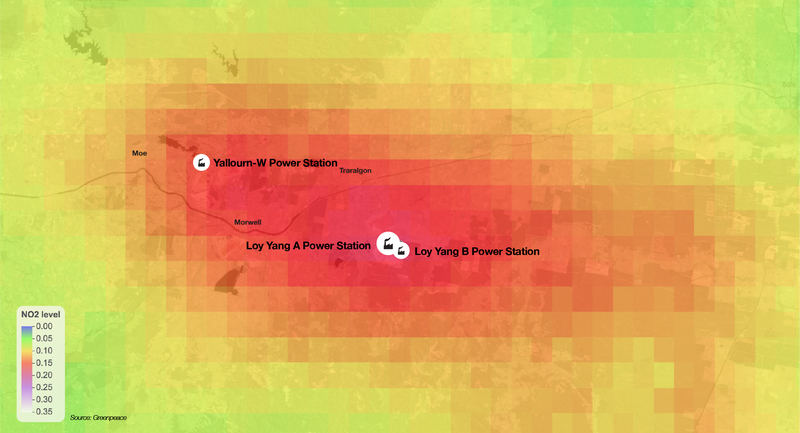 Pollution hotspots captured around the coal-fired power plants surrounding New Delhi in India. 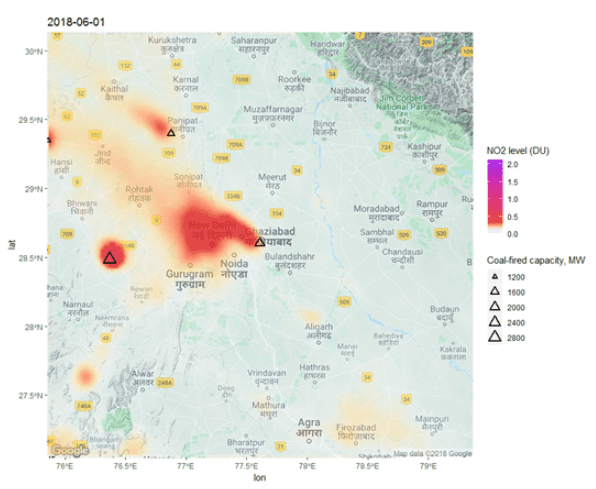 The pollution plume from Dadri National Capital Power Plant is getting blown right into Delhi. Figure 6. 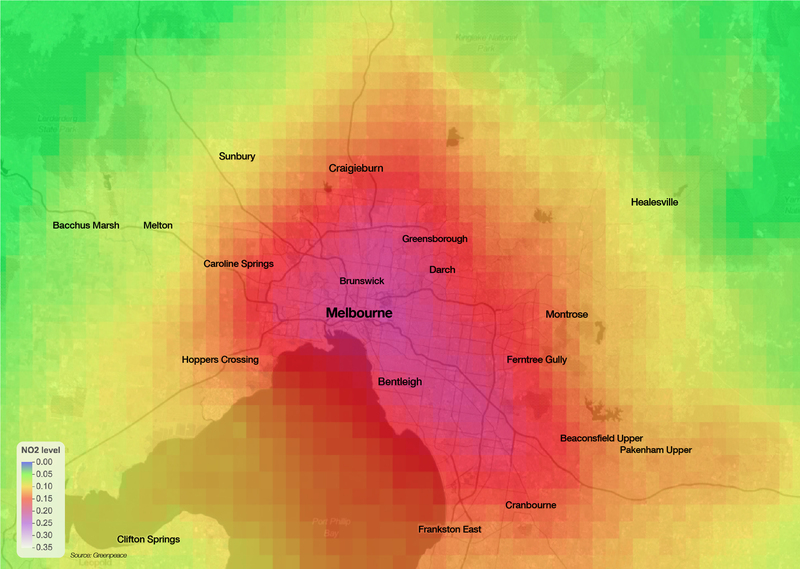 Weekend effect: comparing pollution levels during weekends and workdays reveals the impact of less cars on the road. The vast majority of the identified hotspots threatening air quality and health are related to fossil fuel burning – coal and oil fired power plants and factories as well as unsustainable transport systems. Yet others are related to unsustainable forestry and farming practices. The health toll from these emissions shows the need for an energy revolution that eliminates our reliance on fossil fuels: renewable power generation, energy efficiency, transport and mobility systems that rely less on private cars, as well as electric vehicles. In power plants, low-NOx burners and filters using Selective Catalytic Reduction can substantially reduce NOx pollution. 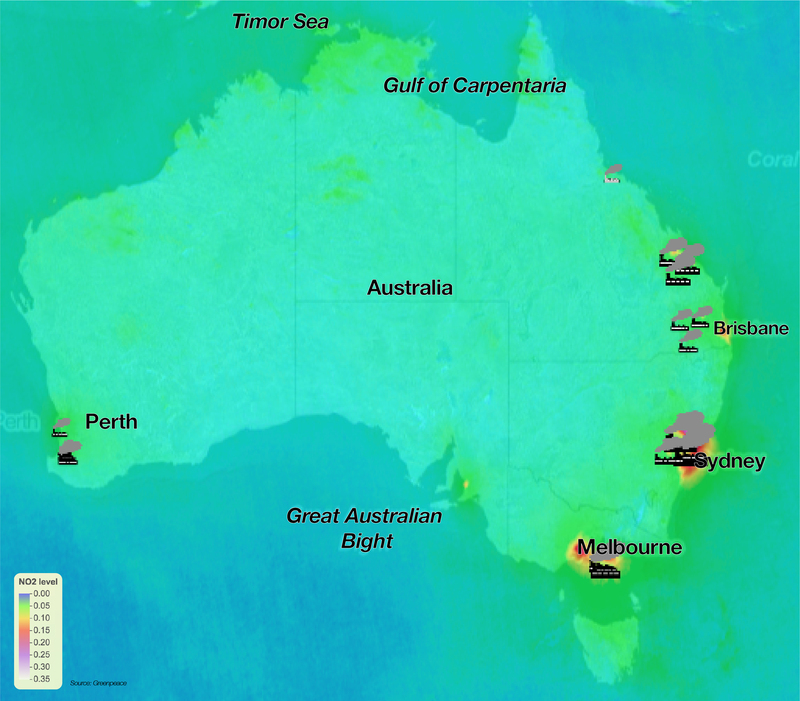 Most of the countries where pollution hotspots are found around coal and oil fired power plants have weak emissions standards that allow these plants to emit multiple times more pollution than best practice. 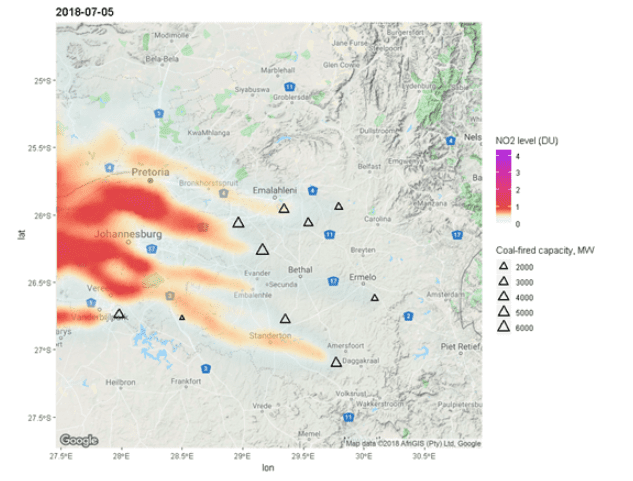 For example, South Africa, with the most prominent power plant hotspot, allows 10 times more NOx from coal-fired power plants than China and Japan. German lignite plants feature as the worst NO2 hotspots in the European Union in part because their emissions standards also lag behind international best practice. Diesel vehicles emit far more NOx than gasoline vehicles, and recent industrial scandals show how this motor technology gained a large market share, especially in Europe, through fraud. Diesel is, nevertheless, part of a larger problem: the internal combustion engine. Private cars burning oil based fuels are a major factor causing air pollution and are also damaging for the climate. We therefore need comprehensive plans to move away from combustion engine vehicles all together, with an immediate focus on diesel, and towards electric powered public transportation; and to radically reduce the number of passenger cars on our roads in favour of active and shared mobility. The daily data was downloaded and processed using the R statistical computing software with the sp and raster spatial libraries. Offline processed data from TEMIS was used until Aug 14 and near-real time data from ESA Copernicus platform was used for Aug 15-31 as offline data was not available yet. Pixels with quality assurance (qa) value below 0.5 were ignored as recommended in the Product User Manual. The data for each day was gridded to 0.025×0.025 degree (1’30”) latitude-longitude grid according to the cell center coordinates. The daily data was interpolated using inverse distance weighted interpolation with a maximum distance of 0.05 degrees to fill in gaps between valid observations but avoiding extrapolation outside areas with valid observations. After interpolation, the daily observations were averaged over time to obtain June-August average NO2 levels. The unit used in the data, Dobson unit (DU), is a unit of measurement of the amount of a trace gas (e.g. NO2) in a vertical column through the full height of the Earth’s atmosphere. The Dobson Unit is defined as the thickness (in units of 10 µm) of a layer of pure gas (e.g. NO2) which would be formed by the total amount in the column (at standard temperature and pressure). 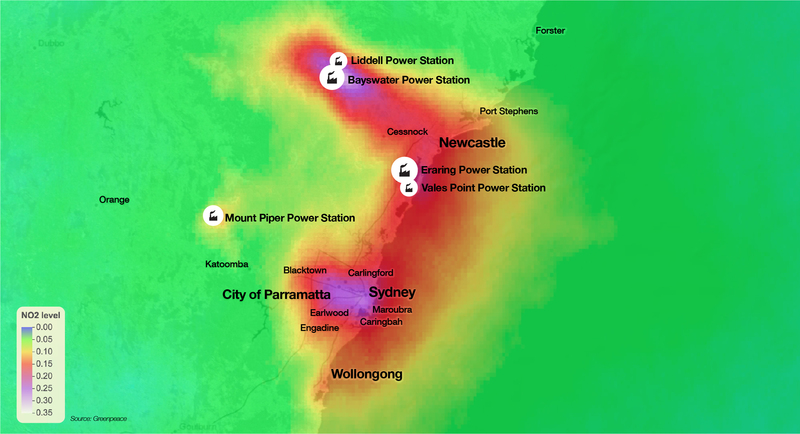 Hotspots were identified by selecting locations with elevated NO2 concentrations seen in the satellite data, the average of NO2 levels at all data points within 25km of each satellite grid cell was calculated and local maxima were identified. 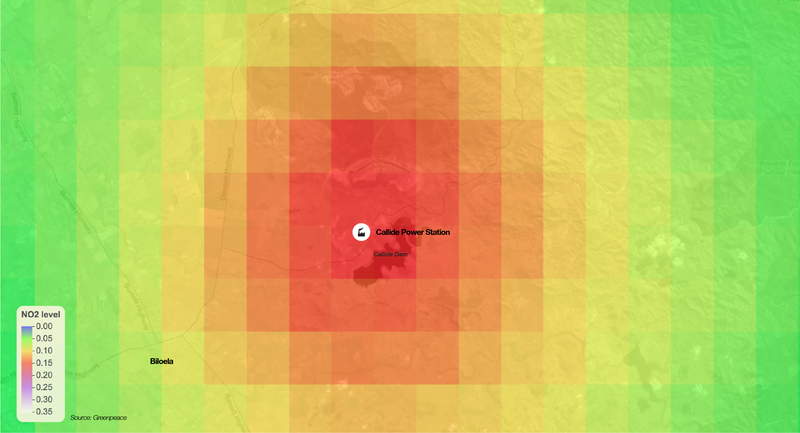 Hotspots are a circle with a radius of 25km, centered on the cell with the highest NO2 concentration. 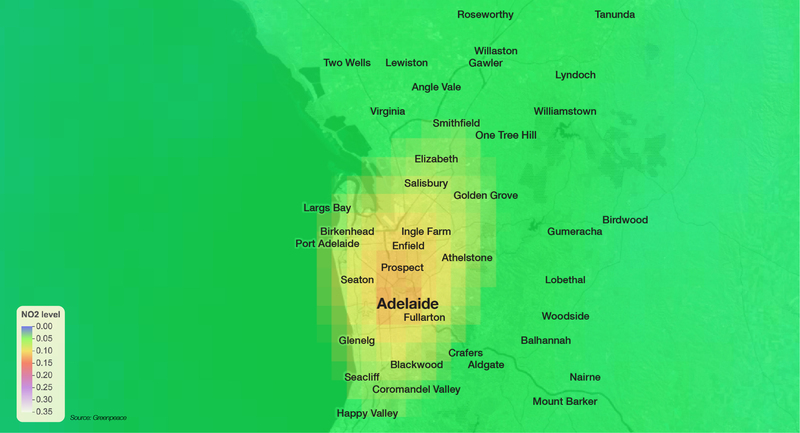 The choice of radius was based on observing the size of NO2 hotspots around isolated sources with no other major emission sources in the area. 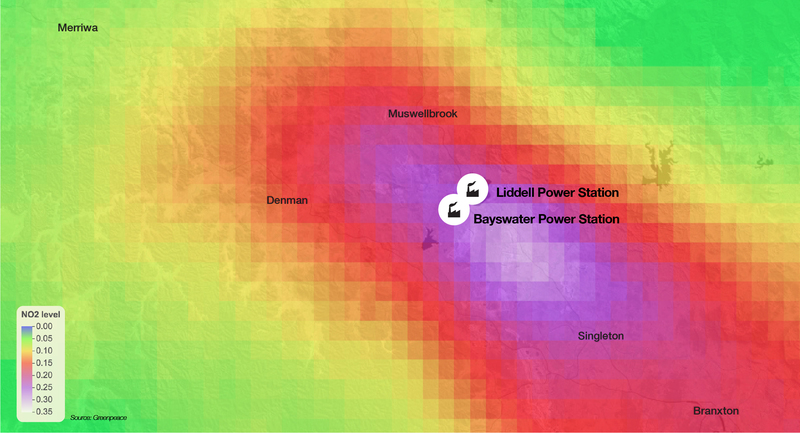 When there were hotspots less than 100km apart, only the one with the highest NO2 level was included to avoid including multiple locations within the same hotspot. 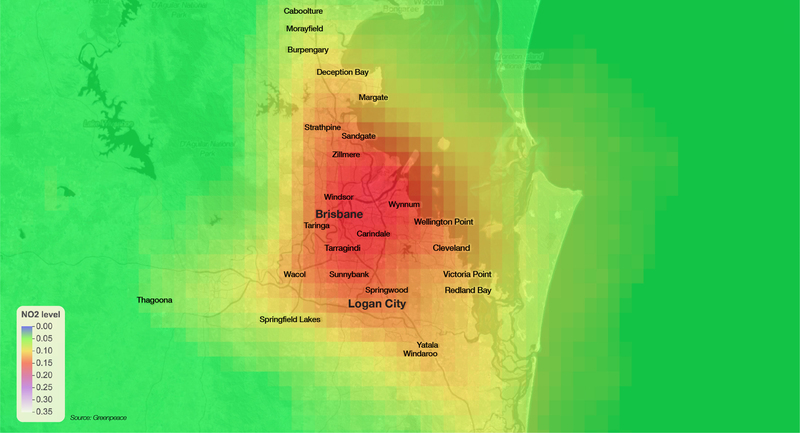 The global EDGAR gridded emission inventory was used to identify main NOx emissions source sectors within that radius – the total emissions by sector within 25km of the hotspot were calculated from the emissions inventory and the share of different sectors was determined. List of global NO2 hotspots, 1 June to 31 August 2018. Note, NOx is the general name for all nitrogen oxides, including gases like NO2 and NO. 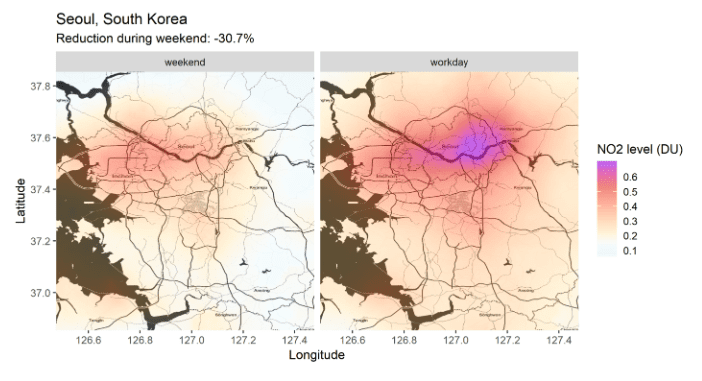 Recognizing that some Middle Eastern and North African countries that had traffic-related NO2 hotspots have weekends on Friday or Friday-Saturday, workdays are taken to be Mon-Thu and weekend is either Sunday or Friday, whichever is lower.